R Fernández-Reyes, JL Piñuel-Raigada, JL Águila Coghlan (2017): “Contrast of the journalistic coverage of climate change and global warming in Spain and in the international sphere: IV-V IPCC Reports and Bali-Copenhagen-Paris”. Revista Latina de Comunicación Social, 72, pp. 1.165 to 1.185. Introduction. 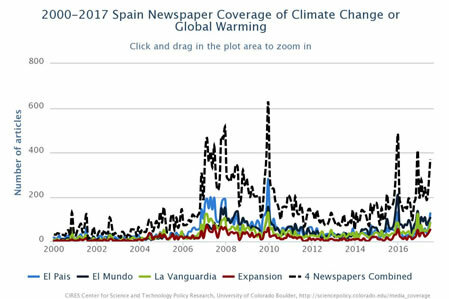 This article addresses the contrast between media coverage of climate change and global warming in Spain and internationally, focusing on the contrast in the months that the IV and the V IPCC Report were published, and in the months that the Bali, Copenhagen and Paris Summits were celebrated. Methodology. The presence of the terms "cambio climático" and "calentamiento global" from January 2000 to June 2017 is studied, through data collected at CIRES, University of Colorado. Results. Coverage in Spain is similar to the international press. It is possible to differentiate five stages, present in both areas. Discussion and Conclusions. The international agenda, mainly political, conditions the national agenda, although both maintain singularities. The general context evidences an insufficient presence of climate change and global warming in printed media, which is not proportional to the growing empirical evidence manifested by the scientists about the risk involved. climate change; global warming; communication; media coverage. 1. Introduction. 2. Theoretical framework, objectives and methodology. 3. Analysis. 3.1. Coverage trends in Spain and internationally. 3.2. Contrast in the months of the coverage of the IV and the V Report of the IPCC. 3.3. Contrast in the months of the Summits of Bali, Copenhagen and Paris. 4. Discussion and conclusions. 5. Notes. 6. References. Public perception of climate change has progressed differently in different nations over time (Capstick et al, 2015). Its evolution began with the alert of the scientists, with the feedback of people from social, political, economic and media fields, among others. Influences are complex, non-linear and dynamic (Boykoff, 2009: 120). Media coverage of climate change and global warming is determined by different elements. In some countries still dominate media debates on its recognition and on the anthropogenic influence (Boykoff 2013; Painter, 2011) although a broad consensus prevails in the scientific literature (Cook et al, 2013). The work of the journalist and the peculiarities of newspaper companies show that climate change and global warming are not treated in a homogeneous way. (Carvalho and Burgess 2005, Fernández-Reyes, 2010, Mancinas, 2013). On the other hand, the emergence of new, and more immediate problems, arising from the economic crisis or corruption are indicated as factors that have been able to influence the reduction of coverage in the Spanish context (Heras, 2015: 251). The 2008 crisis caused a fall in advertising income, which meant less availability of paper and cut in newsrooms. This, coupled with the change in the business model of newspapers due to the incidence of electronic editions, is other elements that have been pointed as influential elements (Picó, 2013: 186). Although, as will be seen later, the international agenda has a considerable weight in national coverage. Western countries were pioneers in research on media treatment by studying the monitoring of climate change and global warming in the mid-1980s. In Spain, public interest in these issues was consolidated in the second half of the 1990s. Although previously there were areas that already perceived that this was an important issue (Meira, 2008, Fernández-Reyes, 2010). Media coverage in Spain presents undulations as in other countries and in international coverage, with historical allusions (Fernández-Reyes, Piñuel-Raigada, Vicente-Mariño, 2015). Research on this field are increasingly numerous (Doulton and Brown, 2009); Boykoff, 2011). Each country covers episodes of international importance, alternated with references to nearby events (Goebbert et al, 2012). These singularities mark specific undulations in the profiles of this treatment in each territory. Among the first studies carried out on the coverage of climate change at the end of the 20th century and the first decade of the 21st century are those of Weingart, Engels and Pansagrau (2000), Peter and Heinrichs (2009) on Germany; Carvalho, (2009), Carvalho and Burgess (2005) on the British press; McComas and Shanahan (1999), Trumbo (1995), Boykoff and Boykoff (2004), Boykoff (2007), Corbett and Durfee (2004), Corbett, Young and Davis B. (2009) on USA; Brossard, Shanahan and McComas on France (2004); Farbotko (2005) in Australia; Lyytimäki and Tapio (2009) in Finland; Good (2008) about Canada. In some cases, they make comparisons with other countries. Subsequently, numerous nations have joined the field of research. Some research has focused on the study of international coverage in a comparative way (Holt and Barkemeyer, 2012); Boykoff et al. (2004-2017) ; Schmidt et al (2013). There are still countries lagging behind, with fewer resources, in which an activation of research is needed. Many of them are especially vulnerable to the severe effects of climate change. Several articles have addressed quantitative coverage of the presence of climate change and global warming in the Spanish media: Águila, 2015; Arcila-Calderón, Mercado, Piñuel y Suárez-Sucre, 2016; Arévalo, 2012; Blanco, Quesada and Teruel, 2013; Caceres, Sánchez and Morales, 2012; Domínguez, Lafita and Mateu, 2016; Erviti y León, 2017; Erviti, 2013; Fernández Parrat, 2009; Fernández-Reyes, Piñuel and Vicente-Mariño, 2015; Fernández-Reyes, 2009; Gaitán and Piñuel, 2012; Leon and Erviti, 2015; Lopera, 2013; Lopera and Moreno, 2014; Lozano, Sánchez y Morales, 2017; Lozano, 2013; Piñuel, Gaitán and Lozano, 2012; Quesada, Blanco y Teruel, 2015; Reig and Alcaide, 2007; Rueda, 2014; Teso 2015, among other investigations. It has also been addressed in collective works such as Piñuel et al (2012), Fernández-Reyes and Mancina-Chavez (2013), Fernández-Reyes and Tourinho (2013), León (2013), Piñuel (2013), León (2014a, b) Piñuel (2016), Fernández-Reyes R, Piñuel J.L, Tourinho I.M. and Carvalho A. (2015), Piñuel (2016) and Fernández-Reyes (2017b). The knowledge of media coverage of climate change and global warming is important to active policies proposals (Meira et al, 2009, 2011, 2013, Teso, 2015, Heras, 2015). In Spain, "social attitude, media attitude and political attitude towards climate change seem closely related, giving the subject a limited relevance” (Heras, 2015: 27) . Although the Spaniards consider it is to be a real problem and in a greater or lesser extent caused by human activity, it does not occupy a prominent place among the problems considered most important by the citizens. And "without communication and social deliberation, is difficult to achieve the necessary social consensus and social will to move towards a resilient and low carbon society facing the climate change” (Heras, 2015: 251 y 15). The ‘bottleneck’ limiting human responses to climate change is not so much technological as social and political (Heras, Meira and Benayas, 2016). This article aims to know the similarities and differences between the national coverage in Spain and the international one. To do this, their trends are studied and the months of coverage of the IV and V IPCC Reports are compared. It also analyzes the three peaks with the greatest coverage in the historical series, such as the Bali, Copenhagen and Paris Summits, in the months analyzed. In an earlier article, coverage in Spain was addressed (Fernández-Reyes, Piñuel-Raigada, Vicente-Mariño, 2015). On this occasion the analyzed period is expanded (from January 2015 to June 2017), a newspaper is studied (Expansión), and the novelty of the study of the Spanish and international coverage is provided in comparative perspective. Likewise, another article studies the comparison of the Copenhagen and Paris Summits (Fernández-Reyes, 2016b). On this occasion, one more Summit (Bali), one more newspaper (Expansion) is added, and part of the counting methodology is changed, improving the quality of the results. As a theoretical framework we are interested in the school of interpretive frameworks, born from the American symbolic interactionism and the European school of sociology, as well as the theory of social representations of Sergi Moscovici (1979), which addresses the construction of reality. On the basis of symbolic interactionism, the theory of interpretive frameworks refers to shared meanings, symbolic structures, and cognitive schemas that organize the perception and direction of collective action (Snow and Benfrod, 1988). The media and their discourses become central elements of the analysis, playing a prominent role in the interpretation of events, working out once as witnesses and as actors. The applied methodology is content analysis (Bardin 1986, Gaitán and Piñuel, 1998). 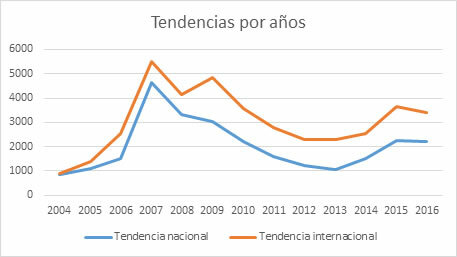 For the study of trends in national and international coverage, the data provided by the Center for Science and Technology Policy Research (CIRES) of the University of Colorado are used, in the period between January 2000 and June 2017 in the Spanish case, and from January 2004 to June 2017 in the international case. The selected Spanish newspapers 3] are El País, El Mundo, La Vanguardia and Expansión. The first two are those of greater diffusion. 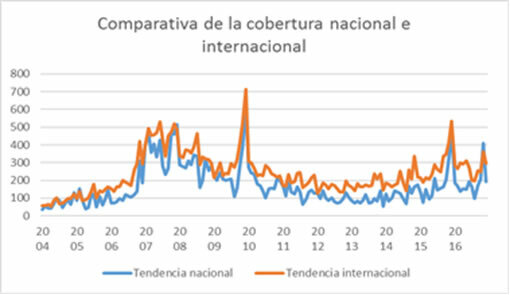 La Vanguardia is the main regional newspaper, while Expansión is in the economic sphere according to the data of the OJD (Office of Justification of the Diffusion), available at http://www.introl.es/medios-controlados/ with data referring to 2015. El Mundo, La Vanguardia and Expansión are studied with the My News search engine since 2000. El País is counted with My News from 2000 to 2004 and with Factiva from 2004. The international journals are fifty headlines from around the world with which CIRES works from the University of Colorado, testing the terms “climate change” or “global warming”. These data are obtained through the Lexis Nexis, ProQuestandFactivadatabases. The selection of newspapers takes into account three main factors: geographical diversity, circulation, and reliable access to archives over time. The account of the information of the Spanish newspapers in My News is made accounting the information. Prior to June 2016, the accounts of the same headline were counted with different numbers of characters, which generated some distortion in the accounts of El País and El Mundo, now corrected . For this reason and the inclusion of a new newspaper, Expansión, some results shown in previous research are modified . The study counts for months, not milestones. It is observed that the significant events generate an opening to a greater treatment of the topic of climate change or global warming. This phenomenon also occurs in the month or months before and after, sometimes without establishing definite feedback links between events and published information. Numerous reports from different areas that warn of the severity of climate change and neglected or skeptical initiatives appear just prior to international policy meetings or IPCC reporting, with the aim of influencing results or interpreting them, to increase the coverage at that stage. It should be noted that the majority of media coverage does not imply a change in public opinion (Leiserowitz, 2004) . The influence of historical events is sometimes shown indirectly in media coverage. At other times it is not seen in the short term and at other times they acquire an autonomous existence independent of the nature of the facts of which it is spoken (Piñuel, Gaitan and Lozano, 2013). Despite this, it is considered that media coverage in the press is an indicator to contemplate when approaching the relevance attributed by society to climate change and global warming. Graph 1 shows a certain similarity in the profiles of the weavers, with greater or less coverage, between the newspapers analyzed. Adding up the amounts provided by each journal is observed, more clearly by the dashed line, what are the peaks in the coverage of the selected press. For months, November and December stand out, dates in which the majority of climatic summits of the UNFCCC have been celebrated. a) A first stage with little coverage, from 2000 to September 2006, among which stand out: November 2000, month in which The Hague Summit was held; July 2001: Bonn Climate Summit, where the Kyoto protocol is addresses (coverage of the IPCC III Report is not appreciable this year); August 2002: Johannesburg Summit; December 2004: Buenos Aires Summit; February 2005: Entry into force of the Kyoto Protocol; July 2005: G8 Meeting; And December 2005: Montreal Summit. At this stage there is a first phase of stability, between 2000 and 2003, and another of increasing coverage from 2004.
b) A second boiling phase, between October 2006 and December 2007, which multiplies the coverage of previous years. At the end of 2006, more media attention began, presumably related to the presentation of the IV IPCC Report months later. in October-November 2006: The Nairobi Summit was held, the Al Gore documentary was released and the Stern Report was published. In 2007 there are numerous special episodes that feedback. They highlight the impact of the IPCC and Al Gore, who shared the Nobel Peace Prize. The IPCC was particularly impressed by the presentation of contributions from the different Working Groups and the Synthesis Report of the Fourth Report. Al Gore was one of the most influential mediators in the field of communication with his visit to Spain, the echo of his documentary and the reception of prizes (Alcíbar, 2007; Gozzer and Domínguez, 2011; Pellisser, 2008; Reig and Alcaide, 2007). c) A downhill phase, with undulations from January 2008 to approximately August 2013, but with a one-off episode that attracted unusual coverage: The Copenhagen summit at the end of 2009. In these years excel the months of June and October 2008, without any special event, but rather a set of episodes independent of each other; In November and December 2010 the Cancún summit stands out; And unveiled without any special event, March 2011 . In 2013 the coverage falls to levels similar to those of the first half of 2006.
d) A new phase ascendant from approximately September 2013 to December 2015 at the time of the Paris Summit. The contribution of Working Group I to the V Report of the IPCC is presented in September 2013. Working Group II, III and the Synthesis Report are presented in March, April and November 2014, respectively. The greatest coverage in 2014 occurs in the months of September, November and December. The World Summit on Climate in New York and the World March against Climate Change coincide in September, mobilizing hundreds of thousands of citizens; In November, the G20 was committed to fighting climate change, and the US and China announced an agreement to cut emissions; In December 2014 the Climate Summit was held in Lima. In 2015 the main peaks appear in June, November and December. In June the Francisco pope's encyclical Laudate Si is published; from August 2015 coverage remains at high levels: this month Obama announces his plan to reduce US emissions in USA; In September the Pope visits the USA, addressing the climate challenge in their speeches; and from October to December the Paris event catalyzes numerous references. e) In the absence of the temporal perspective, a new stage is perceived with higher levels than in previous years. In principle there is a fall in media coverage after the Paris Summit throughout 2016, and a notable rise in November 2016, in which Trump's victory as president of the United States came to generate a greater number of allusions to the terms analyzed than the Marrakesh Summit. Subsequently, some stabilization is perceived, with higher levels than in previous years, in which two peaks of attention stand out that coincide with the appointment of Donald Trump as president (January 2017) and with his decision to withdraw to the US. of the Paris Agreement (June 2017). With this, Trump becomes the milestone in this new stage. A protagonism linked to a negative connotation, due to its attitude towards climate change, which is a novelty in the historical series . In studying the peaks with the greatest coverage, we observed that, in the first stage, they have to do mostly with the months in which the UNFCCC Climate Summits take place. Another issue that had media attraction was the Kyoto Protocol. The second stage, boiling, had the Fourth Report of the IPCC and Al Gore as major players, along with the UNFCCC Bali Summit. The third stage, with a decrease, had its greatest peak around the Copenhagen Summit, and to a lesser extent the Cancun Summit. In the fourth stage, the IPCC is again present with its V Report (with much less coverage than the previous one), and there are several events (commitments of countries of greater influence, marches of the citizenship, protagonism of the Pope) that appear focused towards the Paris Summit, in December 2015, which stands out as a new milestone in coverage. Trump is the protagonist in the last stage. The importance of the prominent role played by the UNFCCC Summits in the media coverage of climate change and global warming in Spain is highlighted. The media agenda is pre-eminently catalyzed by international political events. The three main peaks have coincided with the Summits of Copenhagen, Paris and Bali. As for the differences between the newspapers, it is perceived that El País was the media that more information had until the end of 2010, and after a period with similar proportions to El Mundo, until the end of 2013, El Mundo will prevails to the present. La Vanguardia has historically been third in volume of information, although, starting in January 2016, the catalan newspaper began to rank second, ahead of El País. Expansion, of economic scope, is the newspaper with less coverage. While research on national domains prevails, it is important to study comparisons with other regions (Anderson, 2009: 176). If it is compared the stages of the Spanish coverage with the international one, a considerable similarity is appreciated. At the international level, five stages can also be distinguished: a) A first stage of low coverage between 2004 and August 2006; b) Another stage, boiling, between September 2006 and throughout 2007; c) A downturn phase between 2008 and August 2013, with a special peak: the Copenhagen Summit in December 2009; d) A new stage of increase that takes place between September 2013 and the Paris Summit in December 2015; e) ) A stage with more attention than in previous years, with peaks in months in which Trump assumes a special role. These are the same trends as the coverage in Spain. Parallelism is more consistent with the global scope and with less similarity in the regions of Africa, Asia, the Middle East and South America. The five major milestones of Spanish coverage have to do with the Copenhagen and Paris Summits and with three peaks in 2007. These data coincide with international coverage, although in the case of Spain the three peaks of 2007 were in February, October and December, months in which the contribution of Working Group I to the Fourth IPCC Report was presented, Al Gore visited Spain and two Oscars were awarded for "An Inconvenient Truth" (February); the Nobel Peace Prize was awarded for Al Gore and for the IPCC (October), and the Bali Summit was held (December). In the international coverage the peaks of 2007 were in February (with the international events already mentioned), June (month of the G8 meeting in Germany, where the subject of the climatic change was treated) and November . The national pattern in Spain is similar to patterns of western countries like USA, UK, and Canada, but is different from other countries, like Australia, where the Paris Summit is mistreated, or India where the events of 2007 had no repercussion. Therefore, it should be noted that national coverage has special parallelism with the coverage of Western countries. Spanish and international accounting have different methodologies. In the Spanish case, the result is the sum of the four newspapers analyzed, while in international accounting, it takes the total number of articles of each month in each region and is divided by the number of sources searched during that month. Therefore, the comparison is not based on whole numbers but on trends. As can be appreciated in the graphics 3 and 4, there is considerable parallelism. One of the outstanding similarities in national versus international coverage is that the months in which the contributions of the different Working Groups (WGI, WGII, WGIII), as well as the Synthesis Report in the IV IPCC Report were produced, had greater coverage of climate change and global warming than the V Report, as the data in Tables 2 and 3 clearly demonstrate. In February 2007, when the contribution of Working Group I to the Fourth Report (Paris) was presented, in the newspapers analyzed 465 reports were recorded, compared to 97 that were recorded in the contribution of the same group to the V Report , In September 2013 (Stockholm); In April 2007, month of the contribution of Working Group II of the Fourth Report (Brussels), the number of information was 404, compared with 102 in March 2014 (Yokohama); In May 2007, when the contribution of Group III (Bangkok) was presented, the figure was 334, while in this V Report (Berlin) in April 2014 it was 142. In November 2007, when the Synthesis Report of the Fourth Report (Valencia) was presented, 462 information were recorded, while in November 2014, the month of the presentation of the V Report (Copenhagen), was 165 . Of 1655 articles of the contributions of the different Working groups and of the Report of Synthesis of the Fourth Report appeared in the indicated months, it has become to 506 articles in the V Report. That is, it has fallen 69.43%. In international coverage it has fallen, as can be seen from Table 3, by 52.77%. The decline has been more pronounced in national coverage. As a result, the months in which the IV Report was presented had more media coverage in Spain and in the international context than the V Report, despite the fact that there is a greater knowledge of the risk and a greater scientific strength in the latter. The contributions of the V Report of the IPCC confirmed and reinforced the results of the IV Report, which is based on new evidence drawn from a larger number of observations, improved climate models, a better understanding of processes and feedback from the climate system (IPCC, 2013, 2014a, b). We are, therefore, faced with a media paradox: there was a greater consolidation of the scientific base of the risk of climate change, less uncertainty about the phenomenon, but less media coverage (Fernández-Reyes, Piñuel-Raigada and Vicente-Mariño, 2015). In this section, we study the three main peaks in the historical series of coverage in Spain: the months in which the Summits of Bali (2007), Copenhagen (2009) and Paris (2015) were held. The Bali Summit came at the end of 2007, the year with the greatest effervescence in media coverage. In December, 515 references were counted with the terms "cambio climático" or "calentamiento global”. The month of the appointment in the Danish capital added, in December 2009, 630 references, whereas in December 2015 they fell to 484. Therefore, there was a minor treatment in the month of the French appointment. It is also noted that the proportion of newspapers has changed. El País had a greater proportion of references in the months of the Summits of Bali, with 192, and Copenhagen, with 281, than El Mundo, which added 153 and 156, respectively. In Paris, El Mundo added 210, El País 133, La Vanguardia 85 and Expansión 56. El Mundo relieved El País as the newspaper with the greatest number of references in its printed version. If we make a comparison with other countries through the data offered by CIRES, we observe similarities in the evolution with the USA  and with the UK, and differences with countries such as Australia and Japan, where the coverage in the month of the Paris Summit had little relevance. As for the comparison with international coverage, the result of the percentage of decline is very similar. As can be seen in Table 4, between the Bali and the Copenhagen Summit there was an increase of 122.33% in national coverage and 107.76% in international coverage. Between Copenhagen and Paris, the decline was very similar: national coverage fell 23.18%, while in the international sphere it fell 25.16%. For Boykoff it is important to consider the context to explain the decline in media coverage between the two Summits. This professor of the University of Colorado and director of the CIRES points as an important element a modification in the paper that have acquired the blogs and specialized sites, that have been able to reduce the volume of the information in the main newspapers . On the other hand, in Copenhagen, there were several elements with special media appeal, such as the active role in the Obama talks, the impact of the Climategate, or the tension between the participating countries. The Paris Summit, however, was backed by previous work that generated more confidence, making it more fluid. Obama's position and the Climategate case did not have as much media appeal in Spain . In Copenhagen it may be interesting to value the expectations that were created during the two previous years (remember that 2007 was the year of the media development of this issue). Climate change generated a new and great interest, looking at the main international event in which a reaction was expected. The Paris Summit did not have the novel element of a summit in which there were many expectations, as Copenhagen implied. This element, coupled with "climatic fatigue", the difficulty of keeping media attention in a risky event (Capstick, 2015) and the change in media tendencies cited by Boykoff may be interesting elements to take into account the time to interpret the decline in coverage. Science has shown clear conclusions about climate change. The V IPCC Report (2014) confirms that climate warming is clear as well as human influence, which has already generated impacts on all continents and oceans, and that mitigation and adaptation will be necessary to avoid harmful climatic impacts. Empirical evidence about the risk posed by climate change increases with each new report. It is observed that the main markers of the coverage of climate change and global warming in the analyzed Spanish press appear mainly in the months in which the Summits of the United Nations Framework Convention on Climate Change are celebrated, especially the Summit Copenhagen, Paris and Bali, while many actors from other areas take advantage of these events to mobilize their efforts. COPs, therefore, have a catalytic effect. Other elements that have had special repercussions have had to do with the months in which scientific reports of the IPCC were presented: the III Report went unnoticed, the IV Report had a great mediacoverage, whereas the V Report was reduced considerably with respect to the previous Report. The Kyoto Protocol, the documentary An Inconvenient Truth by Al Gore, political agreements and declarations (Trump), international events, documents such as the Stern report or the encyclical Laudate Si, extreme weather events among other things, are of great media attraction that feed the coverage, at least temporarily, making room among other everyday issues with informational appeal. It would be opportune to investigate what issues are addressed in the everyday beyond such markers. The coverage of the written press on climate change and global warming describes a sinuous path both nationally and internationally, with considerable parallelism. It can be concluded that the tendency of the international agenda has a considerable influence on the tendency of the national agenda. Five stages defined in the Spanish press analyzed, can be distinguished, coupled with the international press: a) a first series of events that had an incipient and limited coverage until the end of 2006; b) a second boiling phase, in 2007; c) a downward phase, with undulations, from 2008 to 2013, with a special episode that attracted unusual coverage: the Copenhagen summit at the end of 2009; and d) a stage of advancement from the end of 2013 to the Paris Summit in December 2015; and e) a stage of promotion between January 2016 and June 2017 compared to previous years, with ups and downs. There is no proportion between evidence of risk and media coverage. The months of the presentation of the V IPCC Report have a lower coverage than the months of the IV Report. And the same has happened between the months of the Summits that have aroused more expectations: Copenhagen and Paris. This is despite a greater power in scientific studies on risks. There is, therefore, a mediatic paradox. The parallelism between international and national coverage, as well as the observation of the importance of the UNFCCC Summits and international politics in media coverage, can give upsurge to two considerations: a positive one, since climate change is tackled global collective action; on the other hand, it can be raised: is the problem of climate change being derived and delegated to the international scope, losing local or immediate protagonism? The disproportionate role of international politics (Carvalho 2010: 175-176) decreases strongly in the nearest scales, carrying the impression that the problem is addressed essentially on the global scale (Heras, 2015: 251 and 278). Likewise, the projection of the challenge in future scenarios may be holding back a greater potential for reaction in the present. As a result, the spatial and temporal closeness is a task that challenge the journalistic exercise. 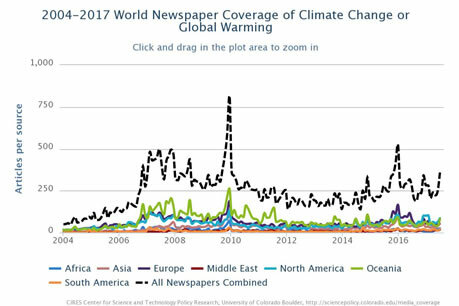 Based on the scientific data, we consider that the Spanish newspapers have to maintain coverage on climate change and global warming more continuous over time, proportional to the increase in knowledge of the risks involved. Equally, we argue that the commitment of journalism in transition (Fernández-Reyes, 2016a) is necessary with the commitment to facilitate the emergence of a whole new culture based on sustainability. It is about favoring a whole cultural change, a global transition towards another paradigm. *Research funded. This article is the result of a research project funded through a statewide public call entitled "The hegemonic discourse of the Media on" Climate Change "(Risk, Uncertainty and Conflict) and experimental test with alternative discourses among young people", was granted by the Ministry of Education and Science to the Complutense University of Madrid, with reference CSO2010-16936, execution period between 2010 and 2013. One striking element is that TV coverage in the US was lower in 2015 than in 2014 according to a study by Media Matters for America. Despite the fact that 2015 is considered an exceptional year for climate news: several hotter months on record, the presentation of the Pope's encyclical, the Obama Energy Plan, the discovery that Exxon financed disinformation campaigns knowing the dangers climate change, the rejection of the Keystone pipeline and, above all, the Paris Summit. http://www.theguardian.com/environment/climate-consensus-97-per-cent/2016/mar/07/during-the-most-important-year-for-climate-news-tv-coverage-fell? Ander egg & Goldsmith (2014) points the importance of Climategate and Glaciergate at the global level in Google searches in November between 2009 and 2010. However in the newspapers of the Spanish media analyzed, we did not find an outstanding treatment of these subjects (Fernández, Piñuel y Vicente, 2015). M Alcíbar (2007): “Una aproximación a la construcción social del cambio climático en An Inconvenient Truth”, en VV.AA: Cultura Verde Volumen 1. Ecología, Cultura y Comunicación. Sevilla: Consejería de Medio Ambiente de la Junta de Andalucía. M Boykoff , M Daly, L Gifford, G Luedecke, L McAllister, A Nacu-Schmidt & K Andrews (2017): World Newspaper Coverage of Climate Change or Global Warming, 2004-2017. Center for Science and Technology Policy Research, Cooperative Institute for Research in Environmental Sciences, University of Colorado, Web. [Date of access.] http://sciencepolicy.colorado.edu/media_coverage. A Carvalho (2009): “Culturas ideológicas y discursos de los medios sobre conocimiento científico. Relectura de noticias sobre cambio climático”, Infoamérica, 1, 25-47. A Carvalho (2010): “Media(ted) discourses and climate change: a focus on political subjectivity and (dis)engagement”, WIREs Climate Change, 1: 172–179. S Capstick, L Whitmarsh, W Poortinga, N Pidgeon & P Upham (2015): “International trends in public perceptions of climate change over the past quarter century”, Wiley Interdisciplinary Reviews: Climate Change, 6 (1), 35-61. J Cook et al. (2013): “Quantifying the consensus on anthropogenic global warming in the scientific literature”, Environmental Research Letters. JB Corbett, LE Young & BL Davis (2009): “Teoría del conflicto e información sobre el cambio climático. Interacción entre los medios, ciencia, política, industria y audiencias”, Infoamérica, 1, 5-23. DM Dotson, SK Jacobson, LL Kaid & JS Carlton (2012): “Media coverage of climate change in Chile: A content analysis of conservative and liberal newspapers”. Environmental Communication: A Journal of Nature and Culture, 6(1), 64-81. H Doulton & K Brown (2009): “Ten years to prevent catastrophe? Discourses of climate change and international development in the UK press”, Global Environmental Change 19, 191–202. MC Erviti (2013): Las imágenes del cambio climático en los informativos de televisión. Análisis de seis televisiones españolas de cobertura nacional. Tesis doctoral, Facultad de Comunicación de la Universidad de Navarra. S Fernández Parratt (2009): “Climate change in Spain's media: a deficient answer”. Infoamérica, 1, 129-138. R Fernández-Reyes, JL Piñuel-Raigada & M Vicente-Mariño (2015): “La cobertura periodística del cambio climático y del calentamiento global en El País, El Mundo y La Vanguardia”, Revista Latina de Comunicación Social, 70, pp. 122 a 140. R Fernández-Reyes & IM Tourinho-Girardi (coords.) (2013): “Tratamiento mediático de las soluciones al cambio climático”, Razón y Palabra 84. México. R Fernández-Reyes, JL Piñuel, IM Tourinho & A Carvalho (coords.) (2015): “Hacia una transición en las prácticas comunicativas ante la irreversibilidad del cambio climático, el previsible fin del petróleo fácil y la escasez de recursos”, Razón y Palabra 91. México. R Fernández-Reyes (2009): El Cambio climático en editoriales de prensa. Ecología Política y Periodismo Ambiental: una propuesta de herramienta de análisis. Tesis doctoral, Universidad Pablo de Olavide. K Goebbert, HC Jenkins-Smith, K Klockow, MC Nowlin & CL Silva (2012): “Weather, Climate, and Worldviews: The Sources and Consequences of Public Perceptions of Changes in Local Weather Patterns”, Weather Climate and Society 2012, 4: 132 - 144. L Gonzalez (2015): “Causas, consecuencias y soluciones. Ciencia y cambio climático en el discurso informativo de Clarín”. La Trama de la Comunicación, 19, 307-328. Universidad Nacional de Rosario. JC Gordon, T Deines, & J Havice (2010): “Global Warming Coverage in the Media: Trends in a Mexico City Newspaper”, Science Communication, 32(2), 143-170. S Gozzer & M Dominguez (2011): “Global climate change in the Spanish media: How the conservative press protrayed Al Gore´s iniciative”, Contributions of Science nº 7, 65-70. F Heras, PA Meira y J Benayas (2016): “Un silencio ensordecedor: el declive del cambio climático como tema comunicativo en España 2008-2012”, Redes.com, Revista de Estudios para el Desarrollo Social de la Comunicación, n. 13, pp.145-161. F Heras (2015): Representaciones sociales del cambio climático en España: aportes para la comunicación. Tesis doctoral, Universidad Autónoma de Madrid. IPCC (2013): AR5 Working Group I. Climate Change 2013: The Physical Science Basis. IPCC (2014a): AR5 Working Group II. Climate Change 2014: Impacts, Adaptation, and Vulnerability. IPCC (2014b): AR5 Working Group III. Climate Change 2014: Mitigation of Climate Change. AA Leiserowitz. (2010): “Day After Tomorrow: Study of Climate Change Risk Perception”,Environment: Science and Policy for Sustainable Development 46: pp. 22-39. R Mancinas Chávez (2013): “El silencio mediático. Reflexión en torno a las razones de los medios de comunicación para no hablar del cambio climático”,en R. Fernández-Reyes (dir.) & R Mancinas Chávez Medios de comunicación y cambio climático (pp. 233-248). Sevilla: Fénix. PA Meira (2008): Comunicar el Cambio Climático. Escenario social y líneas de acción, Madrid: Ministerio de Medio Ambiente y Medio Rural y Marino. PA Meira, M Arto & P Montero (2009): La sociedad ante el cambio climático. Conocimientos, M valoraciones y comportamientos en la población española, 2009. Madrid: Fundación Mapfre. PA Meira, M Arto, F Heras & P Montero (2011): La sociedad ante el cambio climático. Conocimientos, valoraciones y comportamientos en la población española, 2011. Madrid: Fundación Mapfre. PA Meira, M Arto, F Heras, L Iglesias, JJ Lorenzo & P Montero (2013). La respuesta de la sociedad española ante el cambio climático. 2013. Madrid: Fundación Mapfre. G Noguera (2013): “La representación del cambio climático en los medios”, en B. León (coord.) El periodismo ante el cambio climático. Nuevas perspectivas y retos, pp. 45-69). Barcelona: Editorial UOC. J Painter (2011): Poles Apart: the international reporting of climate skepticism. Reuters Institute for the Study of Journalism, University of Oxford. N Pellisser (2008): “La divulgació científica dels problemes mediambientals a través dels mitjans de comunicació. El cas del documental-conferéncia An inconvenient truth”, Quaderns del CAC, 30, 43-49. H Peter & H Heinrichs (2009): “Legitimación retórica de la política climática. El cambio climático en los medios alemanes”, Infoamérica, 1, 59-78. JM Picó (2013): “La crisis económica versus el cambio climático”, en: R. Fernández Reyes (dir.) & R Mancinas Chávez (coord. ), Medios de comunicación y cambio climático. Sevilla: Fénix Editora. JL Piñuel, JC Águila, G Teso, M Vicente & JA Gaitán (eds.) (2012): “Comunicación, controversias e incertidumbres frente al consenso científico acerca del Cambio Climático”, Cuadernos Artesanos de Comunicación, CAC 30. Tenerife: Latina. JL Piñuel, JA Gaitán, & C Lozano (2012):“Los telediarios ante el cambio climático: la deriva de la información sobre la catástrofe en las cumbres del clima y en tiempos de calma”. Actas del IV Congreso Internacional Latina de Comunicación Social, Universidad de La Laguna. A Rueda (2014): El discurso político y el tratamiento periodístico del cambio climático en la prensa española durante las Conferencias de las Partes de Naciones Unidas: de Copenhagen (2009) a Varsovia (2013). Alfara del Patriarca (Valencia): Universidad CEU Cardenal Herrera, Facultad de Humanidades y Ciencias de la Comunicación, Departamento de Comunicación e Información Periodística. M Quesada, E Blanco y L Teruel (2015): “El cambio climático en la prensa europea: discurso editorial en El País, Le Monde, The Guardian y Frankfurter Allgemeine Zeitung”. Estudios sobre el Mensaje Periodístico. Vol. 21, n. 1, pp. 523-539. Madrid: Servicio de Publicaciones de la Universidad Complutense. R Reig & JL Alcaide (2007): “El calentamiento de la prensa ante el cambio climático”, en VV.AA. : Cultura Verde Volumen 1. Ecología, Cultura y Comunicación, 303-326, Sevilla: Consejería de Medio Ambiente de la Junta de Andalucía. B Takahashi & M Meisner (2013): “Climate change in Peruvian newspapers: The role of foreign voices in a context of vulnerability”, Public Understanding of Science, 22(4), 427-442. G Teso (2015): Comunicación y representaciones del cambio climático: el discurso televisivo y el imaginario de los jóvenes españoles. Tesis doctoral, Facultad de Ciencias de la Información de la Universidad Complutense de Madrid. C Trumbo (1995): “Longitudinal modeling of public issues with the agenda-setting process: The case of global warming”, Journalism and Mass Communication Monograph, 152, 1-12. R Zamith, J Pinto & ME Villar (2012): “Constructing Climate Change in the Americas: An Analysis of News Coverage in US and South American Newspapers”, Science Communication. Article received on 2 August 2017. Accepted on 5 October. Published on 12 October 2017.